Chicken or Smart, It Depends How You Look At It! A cold front came with some brisk winds. You would think we would love the winds, which we do when moving, but not at night on anchor. So we made a decision to go into a marina in Daytona. 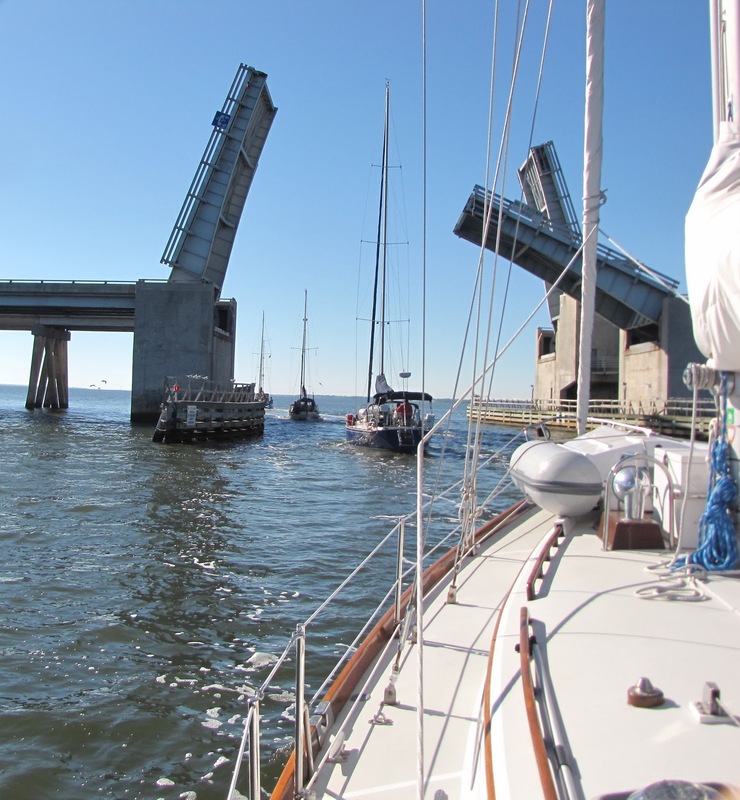 One of the reasons we decided this is because of the circumstances of dockage at the marina, and second, because it was predicted to be in the mid forties at night. Heat would be nice! With the dockage situation, it is that we are planning on docking the boat at Loggerhead Marina in Stuart, FL for three weeks so that we can fly home for 10 days over Thanksgiving. It is cheaper to rent the slip for a month and Loggerhead has reciprocal dockage at other Loggerhead Marinas, one of which is in Daytona, the rest are south of Stuart. So we have a week of days we can use at other Loggerhead marinas, so why not use them when it is so windy and sooooooooo… cold?!! On the way to Daytona Beach the winds were 18-20knots. We sailed in the ICW as you can see by the tilt of the boat with the winds abeam. When we pulled into the marina the winds were still 18 knots. Speaking of knots, that was what my stomach was in, since we had to get into a slip with the winds blowing so strong. However, it was all for “naught” because Al did a perfect job. The cold front definitely came through as it went from the high seventies to the low sixties and finally to the forties for the night. View of Daytona Beach from bridge that we biked. the cold so we did not have to hear the music all night long. On Sunday I went to church. For those who are Catholics and travel, you cannot beat the website, www.masstimes.org. for finding a church in the city you are in. We visited the Arts Festival again and then accomplished various chores. We are getting ready to move on to Titusville area tomorrow since the temperature is suppose to start climbing and be near eighty by midweek Hopefully I will be able to get rid of my fleece top and vest! ﻿ After lunch Al and I visited the island. We hiked the River Trail and got a great shot of Blue Heaven out on the water. 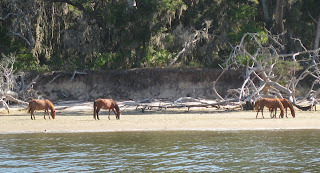 The wild horses were abundant that day. We counted eleven of them in one area at the same time. You can see they are not that wild if I can get a shot that close! 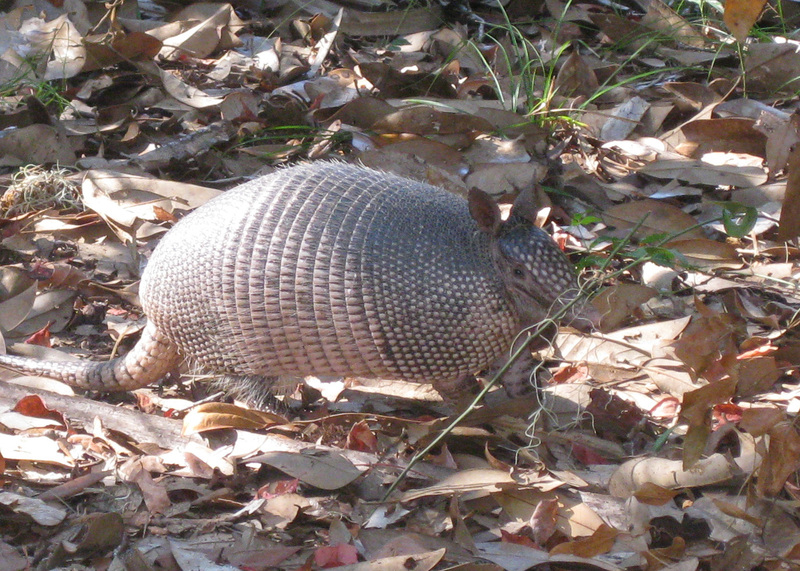 We also saw several armadillos (which blend so well into the surroundings) and a flock of wild turkeys. We also made it to the other side of the island to see the beautiful pristine beach. We certainly got our exercise which we so desperately needed! We ended the day catching up with the Englers on their boat all the while smacking those darn no-see-ums. ﻿﻿With 70% chance of rain, we decided to stay put for another day and spent it doing various chores. It only rained in the morning and then once again around 5PM. We learned high percentages doesn’t mean it will rain all day! After leaving Thunderbolt we anchored in Bull Creek for the first major rain of the trip. It poured on and off for two hours. The front came through with no problems and cooled us down which was great and made for a beautiful sunrise the next day. Al and Tony played golf the next day while I borrowed the Guthrie’s car to run some errands and do some shopping. Later they took us to their country club on the other side of the island which was just exquisite, the furnishings and the food! The Golden Isles Marina must figure they have to keep up with Thunderbolt, because they too delivered a newspaper and fresh muffins instead of Krispy Kremes to your boat every morning. It seemed the resident pelican posed so that you would take his picture. 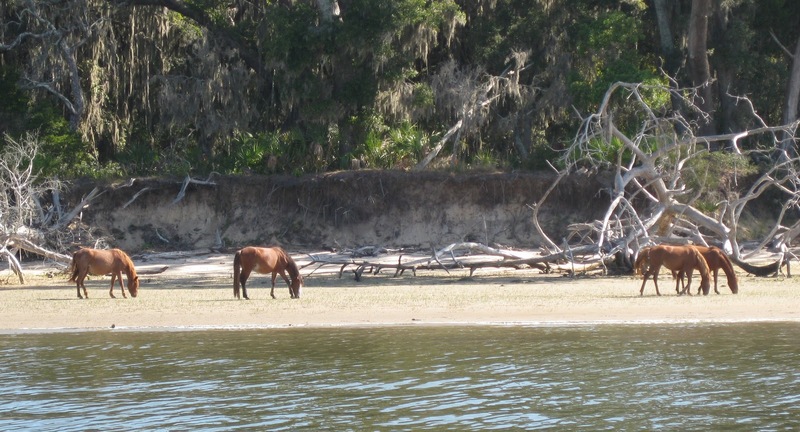 We left the marina around 10am because we were in no rush to try to go through Jekyll Creek on a dropping tide. We got through fine so our plan worked! We anchored off the southern end of Cumberland and ran into Dawn Treader whom we know from the upper bay. They came over for dinner and once again we spent another evening updating each other about our trips and sharing information learned.